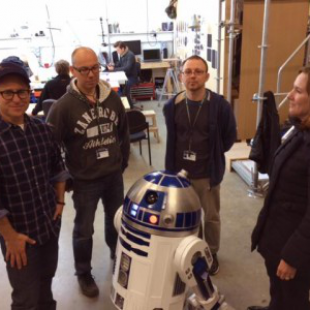 Lee Towersey and Oliver Steeples of the worldwide R2-D2 Builders Club have been hired to build droids for Star Wars: Episode VII. We're going to go ahead and say that we never really doubted that R2-D2 was going to be in Star Wars: Episode VII. The character is arguably as big of a franchise icon as Yoda and Darth Vader and, with the Mark Hamill reprising his role, it only makes sense that his favorite droid (there's no way he liked C-3PO better) would show up as well. Nonetheless, the Star Wars team has confirmed that the beloved astromech droid will be in the film and, happily, that the movie will be using actual props instead of CGI to represent it. Perhaps even cooler on the part of Lucasfilm is the fact that it will be commissioning the services of a team of fan droid builders to create the movie's R2 props. Lee Towersey and Oliver Steeples are both longtime fans of the movie and members of the worldwide R2-D2 Builders Club which creates film-accurate, fully functional replicas of the classic droid. It's a hobby that, according to the duo, caught the attention of Lucasfilm president Kathleen Kennedy. The two were apparently showing off their work at the Star Wars Celebration Europe event this past summer when they ran into to Kennedy, who was touring the area. "She posed for pictures with us, looked at all the droids we'd built and was very complimentary," said Steeples. "I mentioned that the R2-D2 Builders in the UK were available if required, as a semi-joke. When I was contacted to work on the film by [executive producer] Jason McGatlin, it was on her recommendation." Now, Steeples and Towersey are working full-time on droids for Episode VII. "It's a dream come true," said Steeples. "I hope I can live up to the expectations of the thousands of R2-D2 Builders around the world, let alone the millions of Star Wars fans."